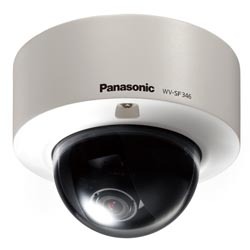 This 3.0 megapixel vandal-resistant IP camera offers multiple stream formats: H.264, MPEG-4 and JPEG compression. 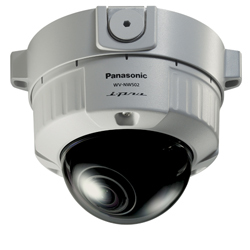 The camera incorporates Panasonic’s exclusive MEGA Super Dynamic camera technology with 128x dynamic range, Adaptive Black Stretch technology to make dark areas more visible, and face detection technology to better identify subjects. 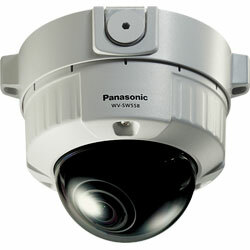 The WV-NW502S provides images at 30 frames per second in H.264 format (in 1.3 megapixel mode). The cameras’ advanced mega Super Dynamic image technology allows more sensitivity for lower light levels (1.0 lux color and 0.08 lux black-and-white at F1.4 in 1.3 megapixel mode) for clear images even when light is dim, which is ideal for 24-hour surveillance. 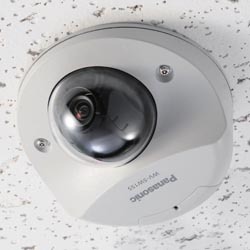 It incorporates a progressive scan megapixel CCD that delivers clear images with less motion blur and no tearing even when subjects are moving. Additional performance features include a primary (RGB) color filter for superior color reproduction, Adaptive Digital Noise Reduction to adjust to changing viewing conditions, and Auto Back Focus (ABF) that adjusts the positioning of the CCD sensor to provide accurate focus in both color and black-and-white modes and reduce post-installation intervention. The WV-NW502S also feature advanced Video Motion Detection (VMD) with four programmable detection areas, 15 sensitivity levels and 10 detection area sizes. 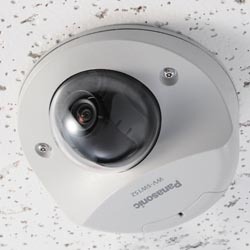 The cameras unique face detection feature locates the position of up to eight human faces, and the information is sent by XML or video stream. Privacy zones can mask up to eight private areas, such as house windows and entrances/exits. Other features include IPv4/v6 compatibility and Power over Ethernet (PoE) to simplify installation.